The moment Ivory Coast beat one of the tournament favorites, Algeria, in the quarter-finals, it looked very likely that they would feature in the finals of the African Nations Cup, too. And they did so in style beating DR Congo 3-1 in the semi-finals. European club stars like Wilfried Bony, Yaya Toure and Gervinho have hit top gear in the knock-out rounds with goals to their names. On the other hand, Ghana prevailed over hosts Equatorial Guinea 3-0 after overcoming the specter of fan violence in a semi-final clash at the Malabo stadium. Avram Grant's men enter the finals on Sunday as traditional favorites. The Black Stars have lifted the African Nations Cup four times, more than any other nation. The last time they did it was way back in 1982. Having really waited long for the fifth they would like to stamp their traditional place as Africa's strongest footballing nation. 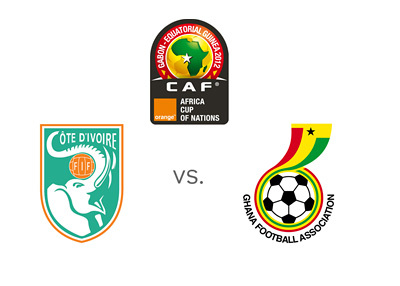 For Ivorians, this is the best chance to prove their mettle. Nearly two-thirds of their talents have been drawn from top European Leagues and they seem to be hitting form at the right time. They have won the Cup just once in 1992 and have never been even runners-up. The Ghanaians apart from the 4 titles, have been runners-up thrice. Ghana have a comparatively younger side and not spangled with the kind of big names that dot the Ivorian line-up. But they are led by Asamoah Gyan, who at 29 is already a national icon. With 89 appearances for his country and 46 goals to his credit, the Black Stars will heavily depend on this man to inspire them to an elusive fifth win. But with French coach Herve Renard as the Ivorian strategist, Les Elephants have reason to believe they are in line for a second title. It is significant to note at this point that Renard had guided rank outsiders Zambia to a sensational 2012 African Cup title win. While Ghana's accent will be on tightening their defense, marking livewires like Bony and Gervinho and create sufficient space for the likes of Asamoah Gyan and Andre Ayew to move forward freely, the Ivorians will try to recreate the same kind of defense-splitting passing and lethal finishing that undid the Algerian's possession-style game. Their defense, on the other hand, will have to watch out for lightning speed counter-attacks from the free-flowing and youthful Ghanaians. On a head-to-head basis there is nothing to differentiate the two, it's so close. In 39 encounters since 1965, both have won 14 matches each and drawn 11 times. Going into the final on Sunday, the odds look Even Stevens.